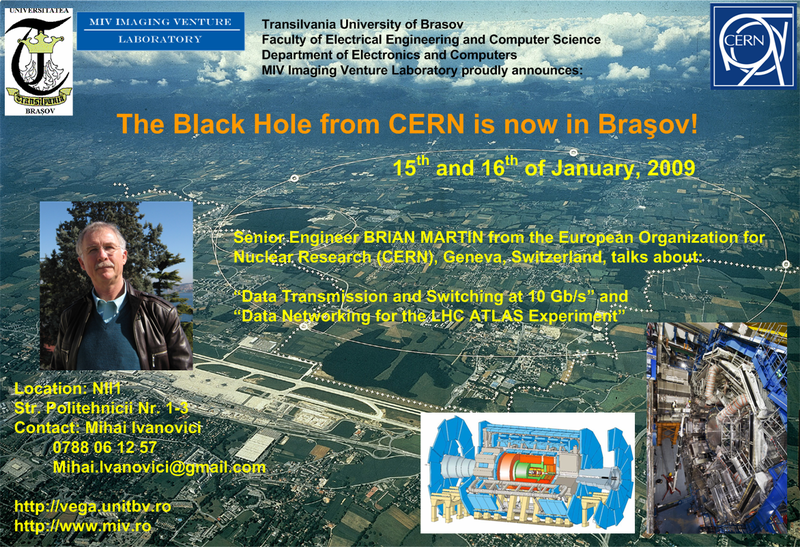 MIV Imaging Venture » Blog Archive » The Black Hole from CERN is now in Brasov! 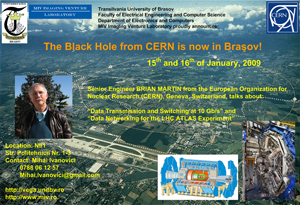 The Black Hole from CERN is now in Brasov! Senior Engineer Brian Martin from CERN (European Organization for Nuclear Research), Geneva, Switzerland, comes to Brasov as our special guest to talk about “Data Transmission and Switching at 10Gb/s” and “Data Networking for the LHC ATLAS Experiment” on 15th and 16th of January, 2009. The presentations are scheduled in the morning, from 9:00 to 12:00. Any modifications will be announced on time! The slides of the presentations are available here: [10Gb/s, PDF,1.8MB] [ATLAS, PDF,728KB]. This entry was posted on Sunday, January 4th, 2009 at 1:15 am	and is filed under Events, News. You can follow any responses to this entry through the RSS 2.0 feed. You can leave a response, or trackback from your own site.